Farewell waterproof camcorder. I knew you well! 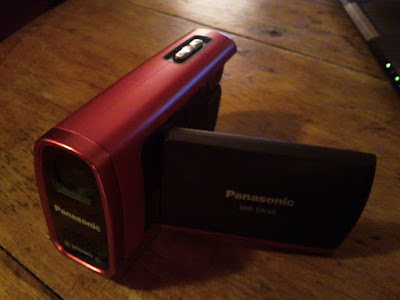 The above photo is that of the Panasonic SDR-SW20, an ebay bargain that unfortunately failed me a few months ago. I discovered this beauty at the Argos Clearance shop on ebay.co.uk back in September 2009 and was drawn to it not only because it was a bargain at £120 but because it boasted waterproofness to 2 meters. This feature was pure peace of mind for the ski teaching job when I may be filming in bad weather, definitely snow and occasionally rain (yes, sometimes even in Tignes). The image quality issues are more obvious in the video of Stewart. In bad light I found that the film was very ‘shaky’ even when digital zoom was deactivated. The still photos also left little to be desired. I can’t say it was all bad though. The easy convenience of the USB connection or SD card made films easy to sync with my computer and opened my eyes to the functions of modern camcorders and their use as a technical analysis tool. The SDR-SW20 failed the ultimate waterproofing test as it didn’t survive a two week trip to St Tropez. Ebay has helped me find a far more suitable replacement and some of the work is already out there in the cloud. Raisa Tackle Tignes and Christmas Came Early are two great examples of the new camera: the Canon FS100. I hope to feature many for videos on the blog before drawing a final conclusion on this powerful piece of kit! This entry was posted in Kit Review on January 18, 2011 by Rorie.